We are proud to present our new TravelTab® persona, GEO! Expect to see GEO in a few places on our device and even at the airport. 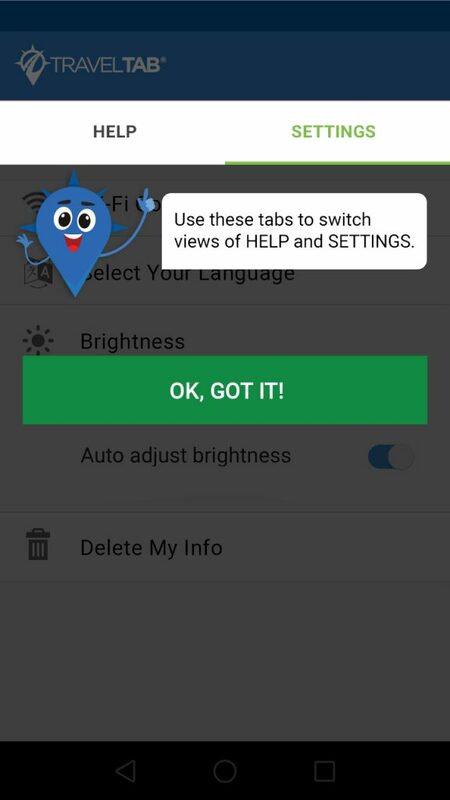 With the exciting update to our Help App on all TravelTab® devices, we are displaying a more organized menu that involves separate tabs for HELP and SETTINGS. With this in mind, we want to make sure our users are not at all confused on where to find certain items. This is where GEO comes in with quick tips to help guide you. As we launch more features, we will continue to strive to create changes for better usability across all our products. Look for GEO to appear across all our TravelTab® device applications to make your in-travel experiences even better. Headquartered in Winter Park, FL, TravelTab® is a privately-held, technology-focused company dedicated to providing robust products for the travel industry. Founded in 2012, TravelTab® has successfully partnered with many world-renowned brands to offer products, technology and service solutions focused on making travel easier for consumers. For more information, visit www.TravelTab.com or find TravelTab® updates on LinkedIn, Twitter, and Facebook.